Senator Jon Tester spoke about his record supporting Montana's veterans at a press conference in Butte. October 18, 2018. Sen. Tester, the ranking Democrat on the Senate Veteran Affairs Committee, represents a state with the second highest per capita veteran populations in the country - about one in 10. He rattled off the bi-partisan accomplishments of the Committee. Most notably passing the Accountability and Whistleblower Protection Act last year, and the VA Mission Act this year - which is aimed at improving veterans’ access to healthcare. Eileen Greb echoed that sentiment. She said those benefits were won with blood sweat and tears. At the podium is Eileen Greb, a retired Navy nurse who worked with Sen. Tester on making the Southwest Montana Veteran's Home in Butte a reality. 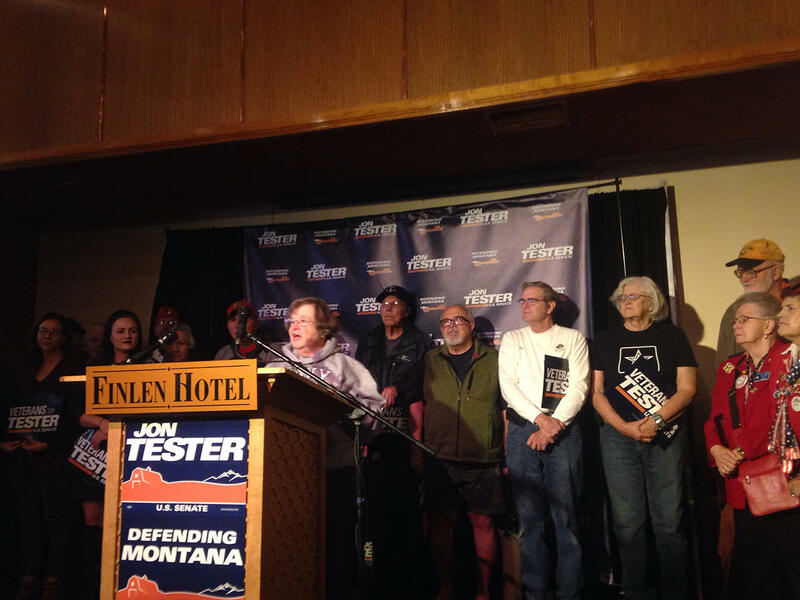 She voiced her support for Sen. Tester at a press conference at the Finlen Hotel in Butte. October 18, 2018. Greb, a retired lieutenant commander, was part of the Navy Nurse Corps in Vietnam and has been an RN for more than 50 years. She said foremost among the many reasons she supports Jon Tester is that he helped find federal funding for the Southwest Montana Veterans Home in Butte - something Rosendale voted against as a state lawmaker. It’s a project she, and Tester, have been working to make a reality for years. When asked if this was the toughest race in his political career, Sen. Tester said “they’re all tough”, and this one, against Matt Rosendale, is no different. As for his current dynamic with President Trump, Tester said he gets his good ideas from Montanans, brings them to like-minded members of Congress, and hopefully they get to the West Wing. “In the case of the Missions Act, the Accountability Act, the Appeals Backlog Act - I mean there’s a bunch of bills we put on the President’s desk. We appreciate him signing them. And we thank him because it's the right thing to do for our veterans. So that’s the relationship,” Tester says. Outside the hotel after the press conference ended, I caught up with Mick Ringsak, who had spoken at the podium earlier. He’s a distinguished Vietnam veteran, retired businessman and lifelong Republican. Nora Saks: “I’m curious, how do you square your support with President Trump, while President Trump is out backing Matt Rosendale, Senator Tester’s opponent, especially on veterans’ issues?" 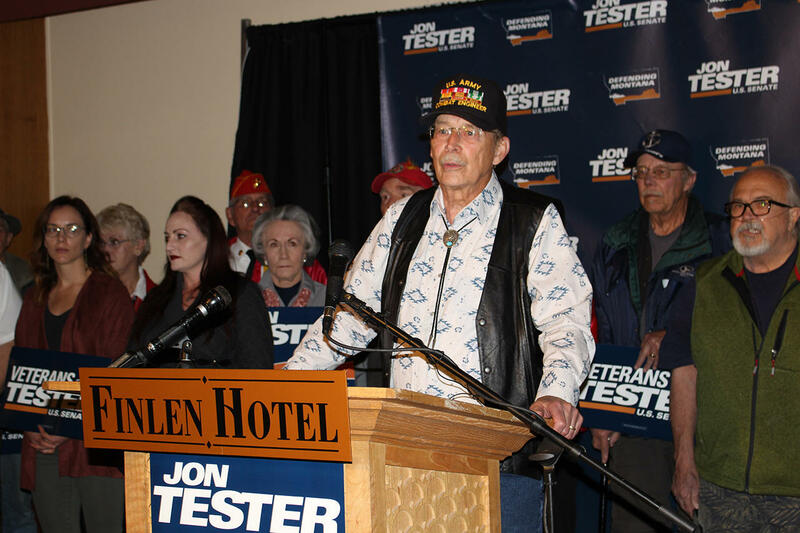 Mick Ringsak is a lifelong Republican and Vietnam veteran who voiced his support for Sen. Tester at a press conference at the Finlen Hotel in Butte. October 18, 2018. Ringsak said he has to go to the VA more than he’d like, and he supports people on the ground working there. But Tester’s bi-partisan Accountability Act has made a big difference in improving the management of the VA, and to him, that’s what matters most. Sen. Tester said he would not be watching or attending President Trump’s rally in Missoula. Instead, he jumped into an SUV headed for Billings, on his way to meet with a bunch of teachers. “The Dude” is stumping for Democrat Jon Tester. Actor Jeff Bridges spoke to the College Democrats of Montana in Bozeman Wednesday, Oct. 17, in the latest celebrity appearance of the state’s increasingly high-profile U.S. Senate race. The actor famous for his chill, bathrobe-wearing character "The Dude" in the film "The Big Lebowski," drew a young crowd of nearly 400 people that local Democrats tried to turn into immediate voters. Democratic U.S. Sen. Jon Tester will be rallying with a group of veterans Thursday in Butte. Tester campaign spokesman Chris Meagher says Tester will talk about his voting history supporting Montana’s veterans and says his Republican opponent Matt Rosendale has voted against resources for the state’s veterans. Campaign finance reports released yesterday show that combined spending by candidates in the U.S. Senate race in Montana has topped $20 million. Incumbent Democrat Jon Tester is outspending Republican Matt Rosendale at nearly a five-to-one clip this election cycle. Tester’s spending is the most by any one campaign in a race for the U.S. Senate in Montana history. U.S. Senator Jon Tester walked up to the union picket line in Three Folks Saturday for the second time since the local Boilermakers #239 were locked out of the Imerys talc plant in early August, amid a bitter labor contract dispute. "Parking for the Presidential Visit will NOT be on Airport property. It will be East of Northstar off Corporate way. Shuttles from the remote parking area will start at 2:00 PM. Please refrain from driving in front of the terminal unless picking up or dropping off passengers.